The CPMR Baltic Sea Commission is, together with the Policy Area Innovation of the EUSBSR, organising this seminar to present the creation of a Smart Specialisation Ecosystem in the Baltic Sea Region. Initiated by several Regions in the Baltic Sea and Interreg funded project partnerships, in close cooperation with Policy Area Innovation of the EUSBSR, this platform aims to contribute to strengthen Innovation Ecosystem in the Baltic Sea Region. The seminar in Tallinn will also be the opportunity to discuss what existing and new funding mechanism should be developed in the upcoming programming period post-2020 to strengthen cooperation on Smart Specialisation Strategies in the Baltic Sea Region. 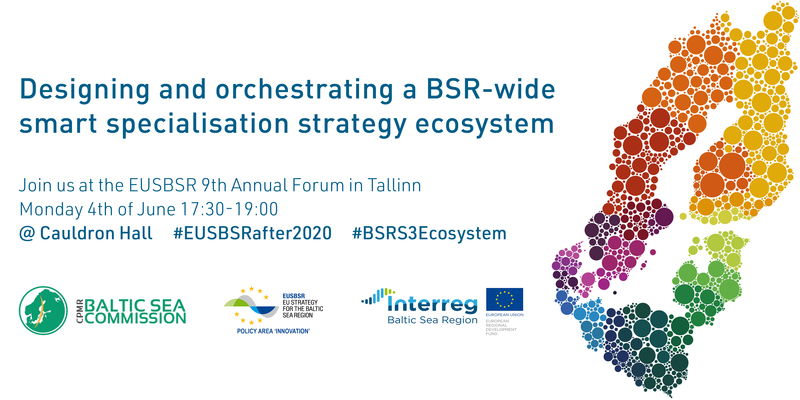 Join us at the EUSBSR 9th Annual Forum in Tallinn on Monday the 4th of June 17:30 – 19:00 at Cauldron Hall! For more information visit the EUSBSR 9th Annual Forum webpage here.